Tag Archive | "Gasteropelecus sternicla"
The Common Hatchetfish (Gasteropelecus sternicla) is also known to tropical fish keeping enthusiasts as the River Hatchetfish and erroneously the Silver Hatchetfish. 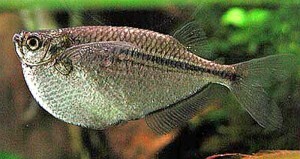 The Common Hatchetfish is found the southern tributaries and smaller streams of the Amazon in Brazil, Guyana, and Surinam. They prefer areas where there is an abundance of surface vegetation where they can retreat to when threatened. Like other Hatchetfish species, they can “fly” several feet from the water to escape depredation and to catch flying insects in the wild. The Common Hatchetfish is a deep bodied, shoaling fish that can reach 2 1/2″ in length and live up to 5 years in an aquarium environment. 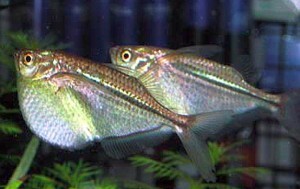 They are among the more uniquely shaped species of fish and have a slender body with a deep protruding “belly” with pectoral fins that are set high on the body. Their mouths are characteristic of true surface dwellers and are upturned. Gasteropelecus sternicla prefer a densely planted aquarium with sandy or fine gravel substrate, some driftwood roots, and a few floating plants to make them feel secure and minimize jumping. Because they are a skittish, schooling species, the Common Hatchetfish is best kept in a groups of six or more of their own kind even with other peaceful, non-boisterous species like tetras, bottom feeding cichlids (Geophagus or Satanoperca sp.) and catfish such as Corydoras or Loricariids. A tightly fitting hood on the aquarium is a necessary for this species as well as excellent water quality. Unfortunately, the Silver Hatchetfish‘s breeding habits have not been documented however, it is believed that the species breeds in soft water with a low pH. Live mosquito larvae and fruit flies are said to trigger spawning behavior with the depositing of eggs on floating plants . Feeding the Common Hatchetfish can be difficult until they are acclimated to their surroundings. Being a carnivore, they prefer live insects but they will eat floating foods like freeze dried bloodworms , tubifex, mosquito larvae, and Drosophila fruit flies . They will eventually accept a high quality carnivore flake food or micro pellets. Common Hatchetfish are often mistakenly sold as “Silver Hatchetfish” (Gasteropelecus levis) in tropical fish keeping shops when they are 1 1/2″ to 2″ in size.